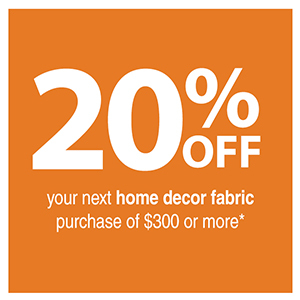 Print and present this coupon at Fabric City Inc.’s 100-04 Northern Blvd., Corona NY Home Decor Fabric Store for 20% off your next fabric purchase of $300 or more. * Offer applies to full price items and can not be combined with other offers. Some special order fabrics may not apply. Share this coupon with friends by clicking the social links below! How much fabric do I need for a chair? How much fabric do I need for a sofa?